Isn't it such a cute little thing? Kudos to big sis on this one. This is my pet turnip. It's very sanguine. This is the official mascot of the Divine Garden. I've been thinking about naming him Raphael. Whaddya think? 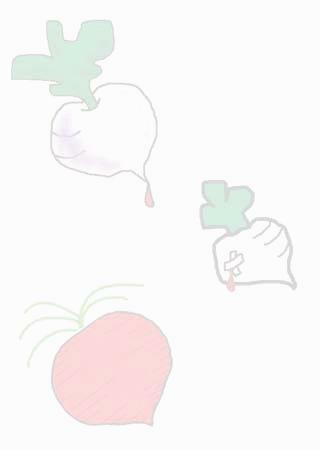 Why is there a bloody turnip here? Think about it. I'm sure whatever reason you can come up with yourself will be infinitely more interesting than any story I could tell you. This page exists for one reason and one alone: as a romping ground for my idle imaginations (since dancing on the grass isn't highly advised), and to stop me from amusing myself in other ways, like playing games or reading fanfics. Now I can waste time in all new creative ways. This page and its contents were created back when I actually had time to waste, about 2 or 3 years ago. Some of the material is outdated, and others were written before I had learned much in the way of more, well, any programming techniques. Learning how to design webpages through extensive usage of netscape composer and notepad isn't always the best way to learn. Also, I'd have to suggest that trying to figure out the bulk of java by using sun's online documentation isn't always the best way of learning either, but when a java book becomes obsolete, what's a girl to do? But now that I've discovered sun's online tutorial pages, (and now that they've added all those nice little pre-packaged things) it's all good. Anyways, this place was intended to house my games. They're all rather primitive, but hey, they were all products of a fleeting boredom, too. Not all of them work the way I want them to, but these weren't written to showcase my brilliance or any such nonsense. More like just something I felt like doing for a while. They occupied my time for a few days, and then flew away. All of them are written in java applets. Please enable them in your browser if you want to see anything at all interesting. spamsweeper For some reason it goes relatively slowly on my computer, even though it seems to go just fine in, say, appletviewer, but then I checked it out and I think it's just going to be slow in general. That's a little disappointing. It's just minesweeper, really, and how fun is minesweeper if you have to play it with a lag time? Best played if a 500x500 applet will fit conveniently on your screen. This was a CS60 homework assignment. twenty questions Well, here's the stripped down version of twenty questions just waiting for you to get your really very anxious fingers on. It is an offshoot of a CS60 hw assignment, and never meant to be appletized. It doesn't do everything I'd like it to do, but take what you can get, ne? Have fun. life Not very descriptive, perhaps, but an adequate title. Come see my dysfunctional, manually driven simulation of Conway's life. Just follow the instructions that have little to do with what the buttons were originally intended for and see a little colony of critters grow into a full grown population. Sadly enough, my version in pascal works better than this does. life v.1.2 This is a much better version of life than the one above because you don't have to manually operate the thing. It's done in java 1.2, so same warnings apply as did to the 1.2 version of nibbles below. othello version 2.2 Next plaything! This is othello. One or two player. Computer's not all that smart, though. Rules and blurbie-do are on the othello page. This was just done on a whim. mastermind The good old game of mastermind. The colors are little bit gaudy, but I'm in no mood to rgb choose my own colors. Another game whipped out on a whim. bugs A little, umm, strategy game? 2 player at the moment, likely to stay that way. Basically your bugs try to get all the other guy's bugs. The instructions are there. Made because a friend programmed bugs in pascal, once. battleship Another classic board game, brought to the computer screen. You against the computer. It works, but it's very aesthetically unpleasing. Yet another whimsy. nibbles version 0.5 Back in the day when I used to play it on the apple, my version was called snake byte, but I guess that was too geeky to be the actual trade name. Written because I heard the CS60 kids were doing this instead of spamsweeper, and I thought, if they could do it, then certainly so could I.
nibbles version >1.2 Better, much better if I do say so myself, nibbles version than the one above. However, one requires a java 1.1.2 or 1.2 plugin to play. It won't work with Java Plug-in 1.1.1 or uncustomized 1.1 browsers. I would also advise the player to run on more than 800x600 resolution or else the applet won't entirely fit on the screen. the following is a personal rant / game wish list. do not feel obliged to read it. eventually, i hope to add in things to life like bull markets in the economy and wars and stuff, that the user can just press a button and get the feeling of playing god with the poor little colony, and i guess i should put some sort of cap on that. i also hope that i can get the twenty questions to save to a file one day. actually, i'm thinking i'll save it to a cookie on the user's computer. of course, each person would have their own tree rather than having a big universal tree, but again, i'll take what i can get. and i hope that i can get othello to be a smarter player. maybe i'll change the colors on mastermind and get it looking a little more aesthetically pleasing. i'd like to get battleship to look much much better too. it looks ... well, almost silly right now. but hey, i'm just a lazy programmer. still, maybe a ship instead of a rectangle would be nice. or even sound effects, although that would just take extra loading time and i think it would get annoying after a while. getting bugs or battleship or something to work over a network would be really ambitious, but where things stand now, i don't think it's gonna happen. especially since i don't think you would do that with a java applet at all. and i want to get that bug-life-checker thing working right. but then i tell myself that you should look for yourself, just like you would if you were playing the game on paper. and i gotta overhaul this page one day. i'd almost opt for something a little more professional looking. or at least, something a little more sophisticated or less cheery or something. but i'd make a terrible graphic artist. maybe when i'm inspired or something. maybe something without turnips. maybe i'll actually do all of this one day. i know you don't really care one way or another. this is really more of my own means of reminding myself that i still have work to do, a guilt sort of thing since i won't delete any of this stuff until it gets fixed. no convenient forgetting for me. anyways, this page created on a friendly pc, in a combination of netscape, notepad, and unix. DISCLAIMER : most of the names of the games that are up here are probably trademarked by milton bradley or whoever else it is that makes games. i do not own any of these game concepts, nor do i have permission to use them.